The extracted ore should be crushed by jaw crusher initially and then by the fine crusher. When it gets the reasonable fineness, it is transported into ball mill by elevating conveyor and belt feeder. The subtle milled ore gets the next procedure: classification. There is a theory that if the weights of solid particles are different, the sedimentations will be different, and the mixed ore can be classified by spiral classifier/screw classifier. 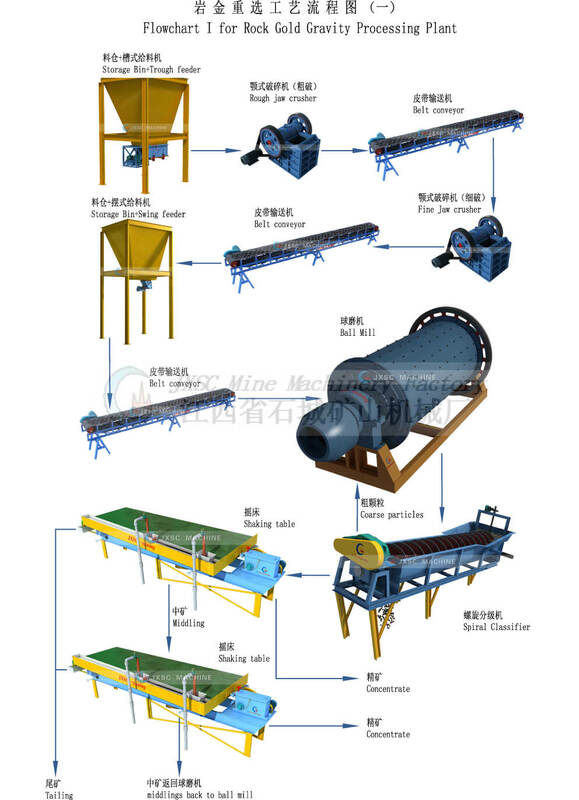 The super fine particles from ball mill will feed into shaking table concentrator through the hydraulic classifier, which can ensure different size distribution ore/slurry feed into different riffles shaking table, in order to reach a higher recovery ratio. JXSC Shaking Table of gold wash plant has more than 30 years experiences. It enjoys a very high, up to 95% high recovery rate which widely used to concentrate free gold. Mercury Distiller / Gold Amalgamator is the traditional gold refining machine, widely used to mix the mercury and gold concentrate, in order to get the pure gold, then we can use Gold melting furnace to produce gold bar. 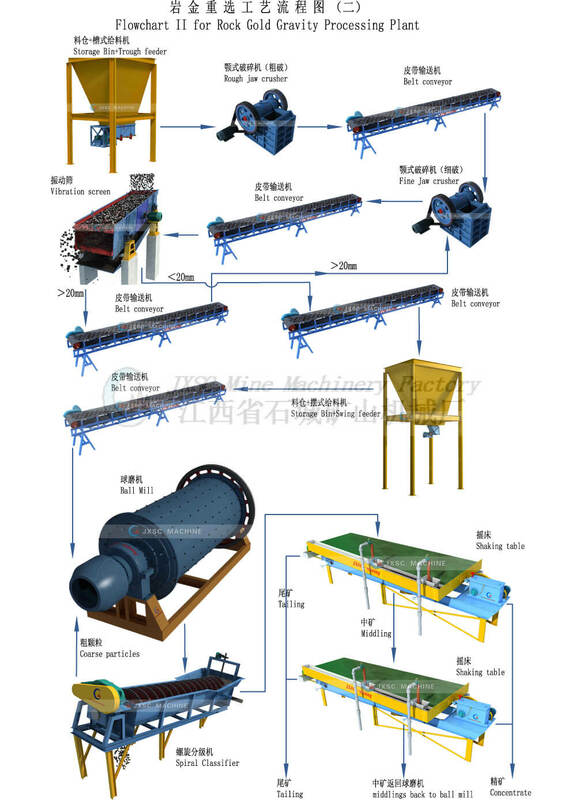 Crushing and Grinding stage & 2.Classifying stage are the same as Gravity process. The classified ore gets into mixing tank for fully mixing. At this stage, the chemical agent for foam can be added. After fully mixing, the slurry will enter into flotation machine. When the flotation equipment works, the motor drives the impeller to revolve, so the centrifugal effect and negative pressure are produced. On one hand, ample air is absorbed and mixed with mineral slurry, on the other hand, the mixed mineral slurry is mingled with additive, meanwhile, the foams are thinning, the mineral is bounded with foams, and floats up to the surface of mineral slurry and the mineralized foam is formed. The liquid surface can be adjusted with the height of adjustment flashboard so that the useful foams are scraped with a squeegee. JXSC is a gold processing plant manufacturer, find qualified gold ore processing plant equipment in China, applied in alluvial gold, mineral process. 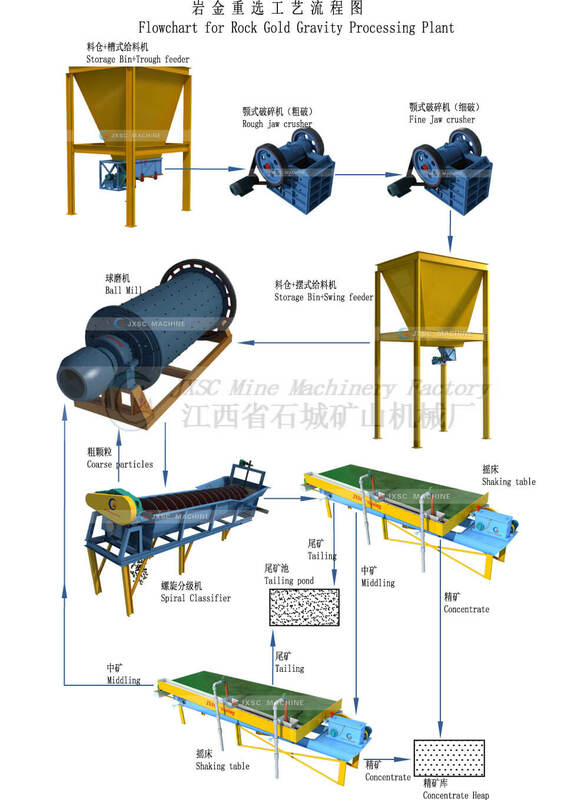 Get the related gold mining equipment include stone crushers, mineral separator, shaking table, spiral classifier, etc.